Climate change is a systemic problem that threatens every aspect of our lives and is caused by anthropogenic greenhouse gas emissions. Current atmospheric greenhouse gas concentrations are at 400 parts per million (ppm), higher than at any time in the past 15 million years. This has caused 0.8˚C of warming so far, resulting in increased food scarcity, incidents of extreme weather, and rapid sea level rise. Climate change is a problem that requires urgent action and a quick transition away from an economy based on fossil fuels in order to reduce atmospheric CO2 concentrations to a safe level, commonly agreed to be 350 ppm. One of the ways of limiting the power of the fossil fuel industry is for institutions to transition their investments away from fossil fuels. Achieving this transition is the core goal of the global fossil fuel divestment movement that was started by 350.org in 2008. By not supporting the fossil fuel industry financially, the movement aims to remove social license from those that are most responsible for creating climate change and in this way promote social, economic, and environmental sustainability. UBCC350 is a political climate action group that aims to use the power of collective action to promote climate justice. Through our campaigns, we advocate for government action on climate policy, political engagement, institutional climate leadership, environmental justice, and Indigenous sovereignty. 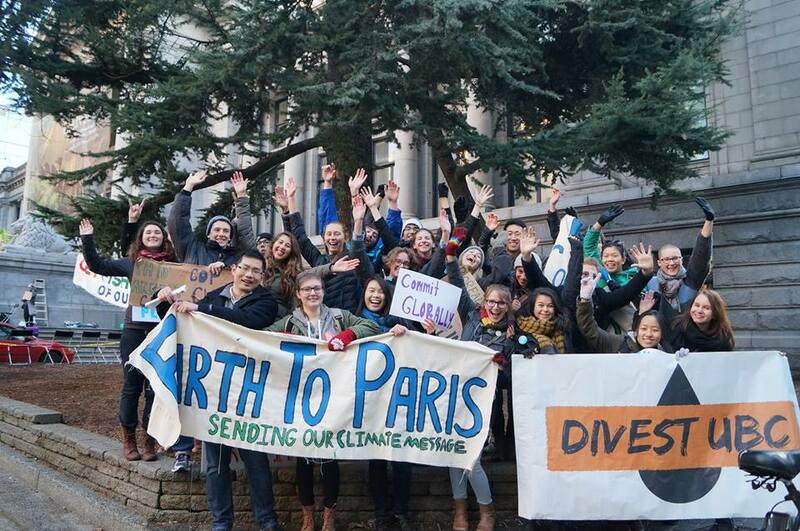 We are committed to climate action on and off campus, and aspire to question the patriarchal, capitalist, and colonial system that perpetuates climate inaction and ensures that some communities disproportionately feel both the negative impacts of resource extraction industries, and those of climate change. We aim to hold UBC accountable to its students and ensure that the University lives up to its vision of “exemplifying all aspects of economic, environmental, and social sustainability.” As part of the global divestment movement, we are pushing UBC to divest from fossil fuels in recognition that their investments support an industry responsible for climate change.